TORONTO, ON / ACCESSWIRE / April 16, 2019 / The National Crowdfunding & Fintech Association (NCFA), the non-profit cross-body organization that promotes and supports fintech and funding throughout Canada, closed its 5th annual flagship Fintech and Financing Conference - FFCON - which featured numerous fintech market leaders, as well as industry experts, government officials, and prominent tech investors. "FEARLESS" was the theme for this year's conference, celebrating the boldness and innovative nature of the FinTech industry, where entrepreneurs constantly challenge pre-existing financial systems with innovative new products and services. The conference brought together more than 500 attendees who experienced keynote speeches, immersive learning, workshops, startup pitch presentations and awards, an exhibitor floor, and networking receptions. The 2019 FFCON Pitch Competition Winner was Vacation Fund - an employer-matched travel savings program for employees. The winning pitch was by Erica Pearson, co-founder & CEO, who accepted the award on behalf of Vacation Fund from Richard Carlton, CEO of the Canadian Securities Exchange (CSE). FFCON19 FEARLESS was proud to have screened the Toronto premiere of TRUST MACHINE: The Story about Blockchain. The documentary and Q&A with John Lyotier, RightMesh CEO, was well received by the sold-out room at Gowlings and shone a light on the history and advancements of blockchain technology. FFCON19 held an extremely popular consultation with The Honorable Bill Walker, Minister of Consumer and Government Services in Ontario, and steward of the province's new data policy. NCFA expanded this year's program with the formal launch of its inaugural online Global Fintech Education program for entrepreneurs in conjunction with Next Decentrum Technologies. Attendees had an exclusive first look at the program with VIP attendees having received complimentary enrolment with conference registration. Early access to the program is now open and program directors are encouraging partners and fintech experts globally to connect to explore opportunities here. Coinsquare, the Toronto based cryptocurrency exchange, announced the launch of eCAD™, the first stablecoin pegged to the Canadian Dollar. eCAD™ marks the beginning of a new era for cryptocurrency mass adoption as it will create the first transparent, affordable, and secure way of transferring value in Canada and beyond, without the risk of instability of the traditional cryptocurrency market. Coinsquare continues to cement their place as one of Canada's most reliable cryptocurrency exchanges. 3iQ Corp, the investment fund manager with a focus on cryptocurrency holdings, announced that it signed a letter of intent (LOI) to acquire First Block Capital's FBC Bitcoin Trust and Distributed Ledger Technology Adopters ETF. 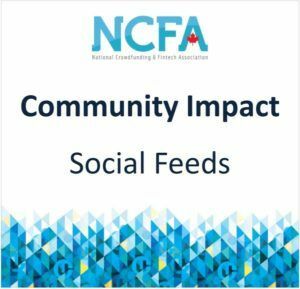 FFCON (Fintech and Financing Conference) is an annual conference hosted by Canada's National Crowdfunding and Fintech Association (NCFA). Now in its fifth year, FFCON19 brought together professionals and innovators in fintech, blockchain, cryptocurrency, and alternative finance. The theme of FFCON19 was FEARLESS which exudes the boldness of the fintech space where small players are challenging orthodoxy, going against convention and transforming the financial industry with innovative models and thinking. Further information about the conference series can be found at www.fintechandfunding.com.